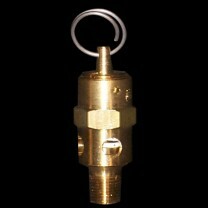 Home :: Pneumatic Parts :: 125 psi safety pop-off valve. Install an additional line of defense: a 125 psi pop-off valve directly on the reservoir. If SCH40 pipe fittings are used it is rated for higher pressures--but why take a chance? Pumping it up to higher pressures really puts a lot of load on the compressor, too. Compressed gas and plastic pipe are not perfect for each other and this device can make things a little better for everyone. 1/8" NPT threads on the base, either plumb it in with fittings, or thread directly into a pipe/fitting location (where the plastic is twice as thick) by drilling a 11/32" diameter hole.